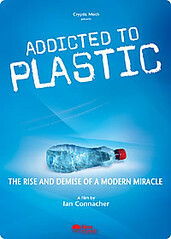 'Addicted to Plastic' answers all your burning questions -- and all the questions you never thought to ask -- about plastic. April 27, 2009, 3:04 p.m. Plastic pollution is complicated for the newbie. Sure, the visible aspects of plastic pollution — single-use bags stuck in trees, styrofoam cups lining the gutters — are pretty obvious, but many plasticky problems today require knowing not only what BPA, phthalates, PVC, and other strange words and acronyms mean, but what complex problems they do or could cause. Considering that each one of those words and acronyms mean — as you may have guessed — bad news, and considering that plastic seems so ubiquitous in our lives to be unavoidable, most people aren’t particularly inclined to investigate each dangerous plastic-related problem. Ignorance, when it comes to plastics, can really seem like bliss — or at least a lot more time to do other, more enjoyable things. Luckily, a new eco-documentary has compressed this steep plastic learning curve into an entertaining 85 minutes. Addicted to Plastic follows filmmaker Ian Connacher, who travels all over the world to find out everything about plastic from a layperson’s perspective. Ian visits 12 countries in three years, seeking out experts and scientists and even a plastic industry spokesperson for their expertise and point of view. Going from a swirling plastic soup in the middle of the ocean to plastic recycling plants to the chicken farm where feathers are harvested to create a new bioplastic, Addicted to Plastic covers both the major, massive problems of plastic pollution on our health and environment as well as many of the proposed solutions for dealing with this mess we’ve created. This focus on solutions is what gives Addicted to Plastic its more sanguine note, especially compared to most environmental documentaries. We see African countries that have banned plastic bags, companies around the world working to find ways to reuse and recycle plastics, and scientists and activists trying to educate the public about plastic pollution. I do have to agree with Beth of Fake Plastic Fish’s opinion that the film’s perhaps a bit TOO sanguine. Says Beth: “The one criticism I have of this film is the insistence that technology will save us from our plastic mess and the film’s lack of emphasis on personal choice and responsibility.” I would add that the film could perhaps emphasize government policies, too. After all, those policies shape what personal choices and responsibilities we can take. It’s easy enough to tell people to avoid BPA — but not so easy for people to avoid it when the stuff’s allowed — and thus present in — almost all cans, some plastic containers and even some baby bottles. Yes, we need people to make better choices — but we also need stronger environmental policies that allow people to make better choices. And to get such policies passed, we need people who know about and are ready to take action against plastic pollution! So watch Addicted to Plastic! You can either watch it on the Sundance Channel tomorrow, Tues., April 28 at 10 p.m., or subscribe to the Earth Cinema Circle DVD club, which’ll feature Addicted to Plastic next month.